I've been storing up the products that just haven't been making the grade. Here's five that are being banished from my cosmetic collection. 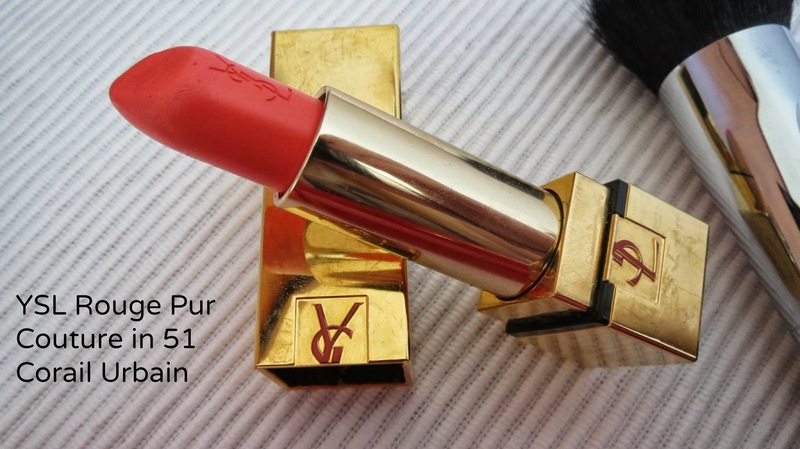 First up is a lipstick from YSL. It was so bad I dedicated a whole blog post to it here back in September. Sadly it was so drying it was literally peeling off my lips within a few hours, I couldn't get it to work at all on me. The colour though is Uh-mazing so it makes me so sad to give it a bad review. Reviews of the Rouge Pur Couture line in general are good though-this was a limited edition for Fall so I wonder if they tweaked the formula a bit? Also, the packaging was beautiful to start with but after a couple of days in my make up bag look at the state of it! It was covered in tiny scratches. 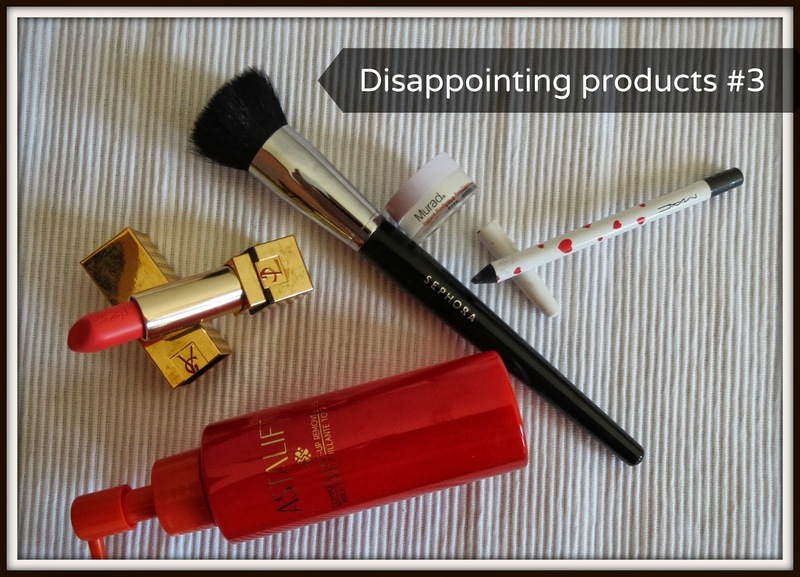 The second item is a foundation brush from Sephora. 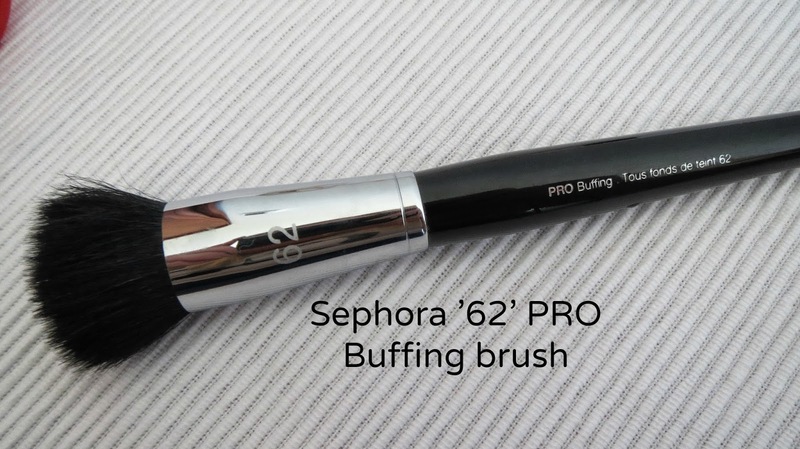 Just as the colour of the YSL is gorgeous, the buffing ability of this brush for applying liquid foundation is perfect. The problem with this brush is that it sheds so much. There were literally little black hairs everywhere on my face. I've washed it a couple of times to see if that helps but sadly it doesn't. I have a lot of the Sephora Pro brushes and as a whole they are absolutely excellent and I would highly recommend them but this one belongs in the bin. Astalift is a brand that doesn't seem to be blogged about very much. It's a Japanese anti ageing brand which you can purchase from Debenhams, Cult Beauty and Feel Unique. The oil is slightly rose scented and orange in colour and does a decent job of breaking down make up. The problem I have with it is that it broke me out after just two uses. I have noticed my skin has become intolerant to oil cleansers-so I am not saying this is a bad product at all, it just didn't work for me. It gets very good reviews on the Debenhams website. 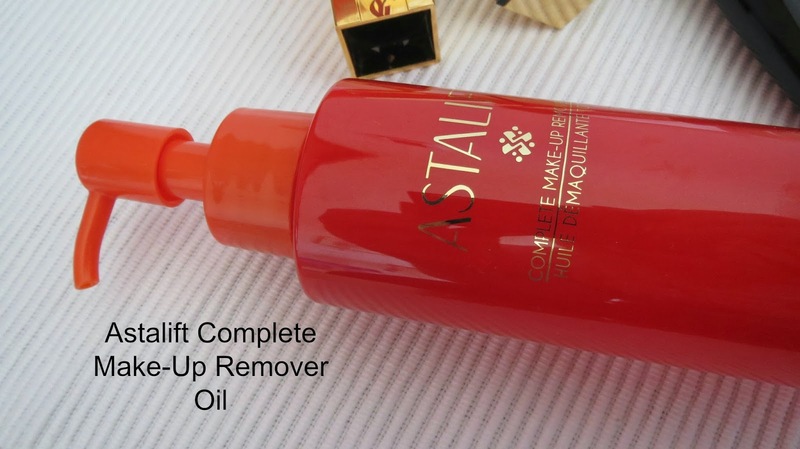 I am actually using the Astalift make up remover gel now as my first cleanse in the evening and I like it so I definitely haven't been put off the brand. Remember the much hyped 'Archie's Girls' collection from Mac? I purchased this eyeliner in 'Black Swan' which is black with gold pearl sparkle through it. The pearlglide eyeliners are softer than the normal kohl liners but this one is so soft I can't use it without making myself look like I have been punched in the eye. I have never been very good with eyeliner so this is a miss for me. 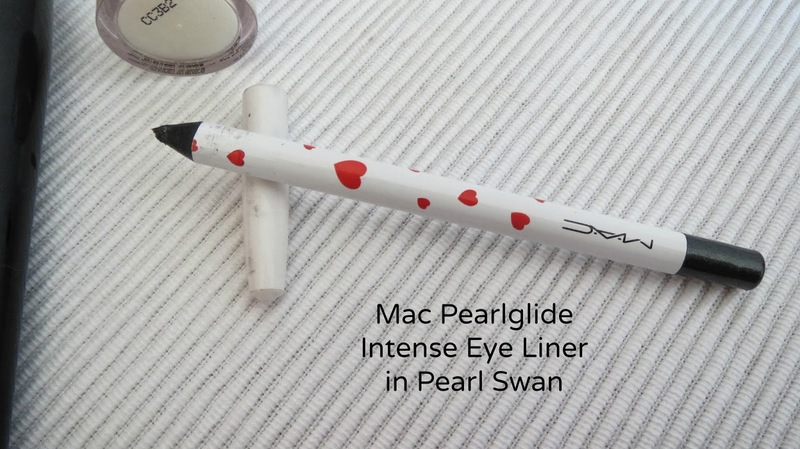 I have the pearlglide eyeliner in Undercurrent which is a gorgeous green but for some reason Black Swan is much softer and crumbles and smudges when I try to use it. 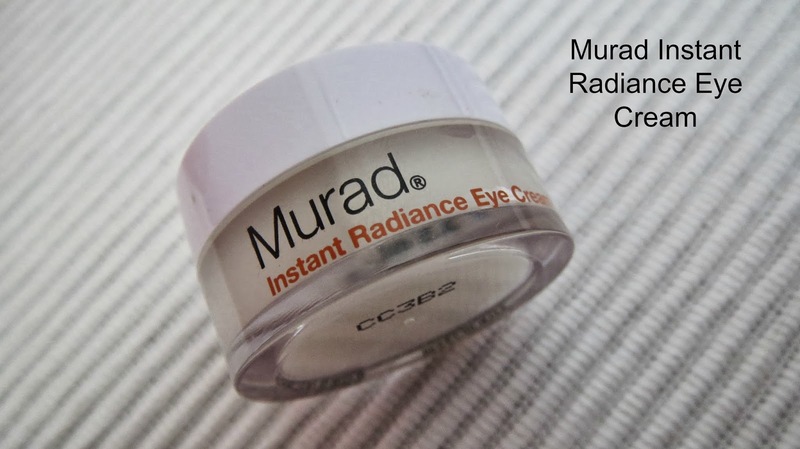 Finally, my last disappointing product is the Murad Instant Radiance Eye Cream. This is only a deluxe sample size, I think it was a 100 point perk from Sephora. Again this has good points which are overridden by one really bad point. When you apply this eye cream it feels really nice-the formula definitely has silicone in it because it feels velvety soft and when you apply it you can actually see it smooth out fine lines. The problem for me is it literally burns the skin under my eye. It's not a tingle or slight discomfort, it literally feels like the skin is burning. The first time I used it the skin puckered under my eye like a burn mark and didn't look right for about 5 days. I tried it again this week and although the skin didn't pucker again (I guess it reacted with some other skin product I was using the first time) but I felt that awful burning sensation again. I would love to know what individual ingredient irritated me because actually you could see instant benefits from the formula. I have a question-what do you think about blogsale-ing disappointing products? From these I would probably blog sale the cleanser as it's only be used twice and is in a sealed bottle and maybe the lipstick because it's been used twice as well even though I would make any buyer aware the case is scratched. I wouldn't blog sale the brush because I don't want anyone suffering the tiny black hair syndrome and definitely not the eye cream as it's in a pot and not hygienically sealed. Not sure about the eyeliner. Is it a case of one beauty bloggers trash is another beauty bloggers treasure or do you think the whole lot should just be binned? I would love to hear your thoughts.